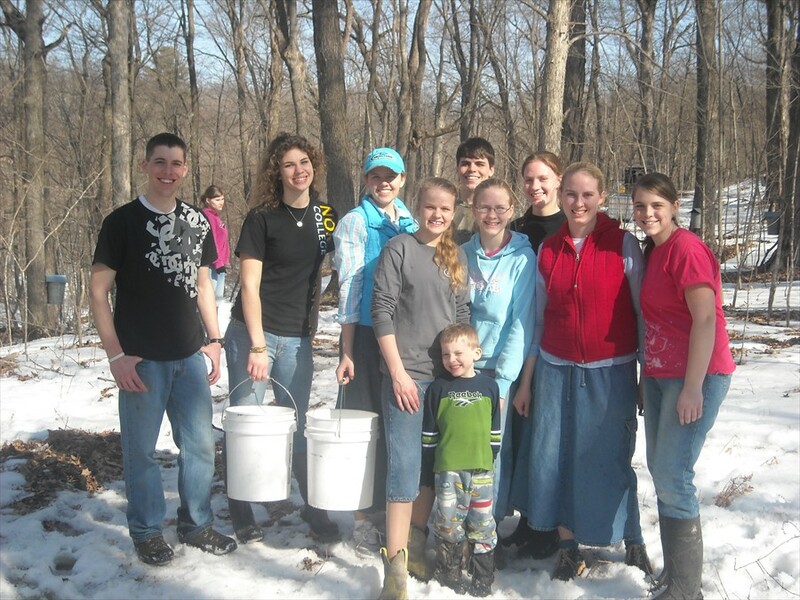 Springtime in the woods at The Wilderness Fellowship Ministries is exciting and teeming with extra activity. Taps are being put out, sap collected, and the sweet steam rises from the cooker as the sap is transformed into rich, flavorful maple syrup. Volunteers come to learn, help with the process, and see for themselves the wonder of God’s creation. One life lesson we’ve learned through the maple syrup process is that the tree does not give up the sap unless there is a wound, cut or break. Then when gathered together the sap can only be made into syrup with fire and heat, but in the careful watchful hands of the Master, what comes from scar and pain can be turned into something wonderful, sweet and satisfying. This lesson plays out before us each day in this life. The key? He knows when the refining process is done and removes the heat. Done right and well, the sweetness remains as a delight to all who taste of it. 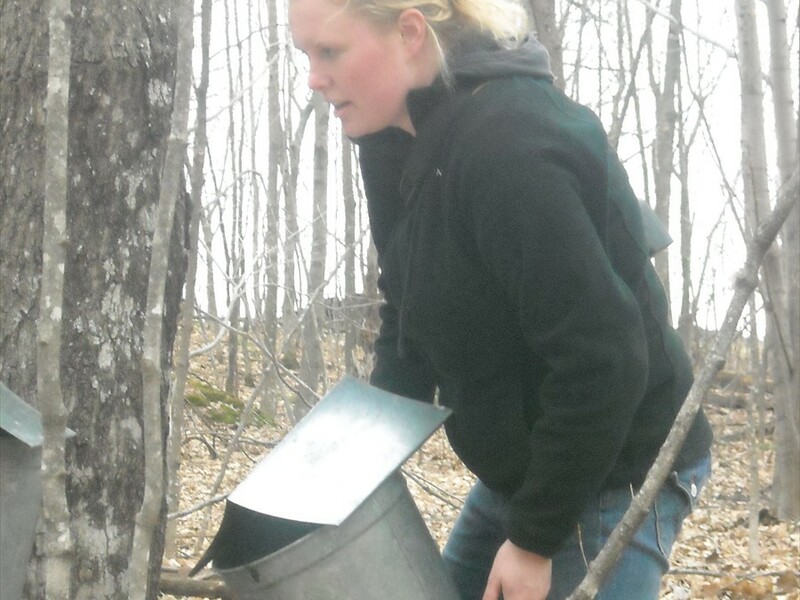 Pure Maple Syrup = Maple Trees + Volunteers + Bucket System or Vacuum/Pipeline System + Cooker + Fancy Bottles! For larger views of photos in this photo album, click any photo in the photo scroller, above. 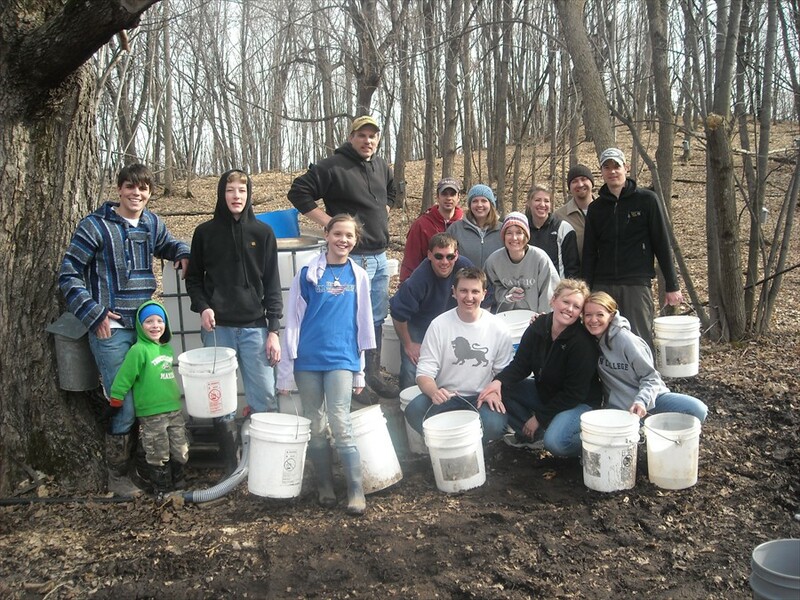 All of our syrup is made from sap harvested on site by a multitude of volunteers helping with all aspects of the whole process. The sap is then boiled in a wood-fired evaporator and bottled at a commercial bottling plant not far from the ministry property. Maple syrup is made by boiling the sap from maple trees until it becomes 66% sugar. 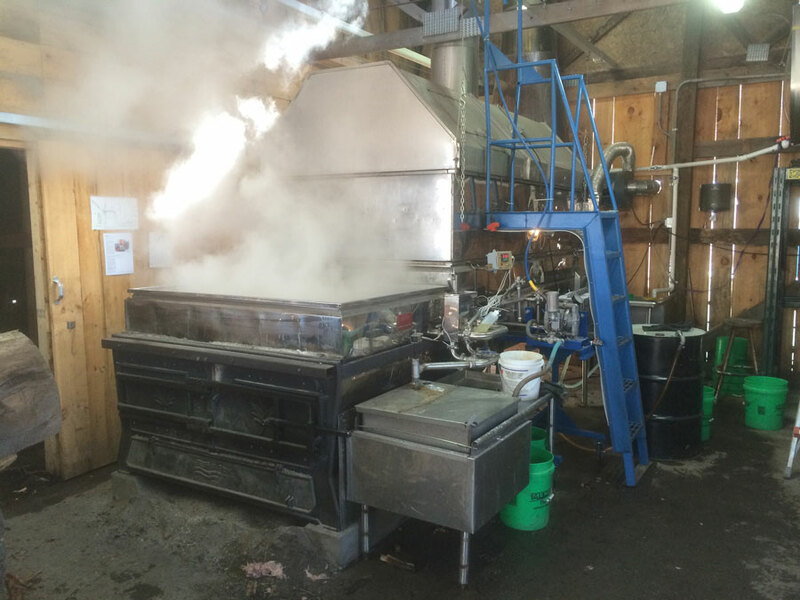 When the sap first comes out of the trees, it is 2.5% to 3.5% sugar, so it takes a lot of boiling to get it to 66%. 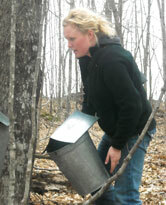 The sap starts to “run” in the Spring when the days get above freezing and the nights drop below freezing. The season usually starts somewhere around March 15 and lasts till about April 15. When this freeze/thaw pattern starts it is time to tap the trees. 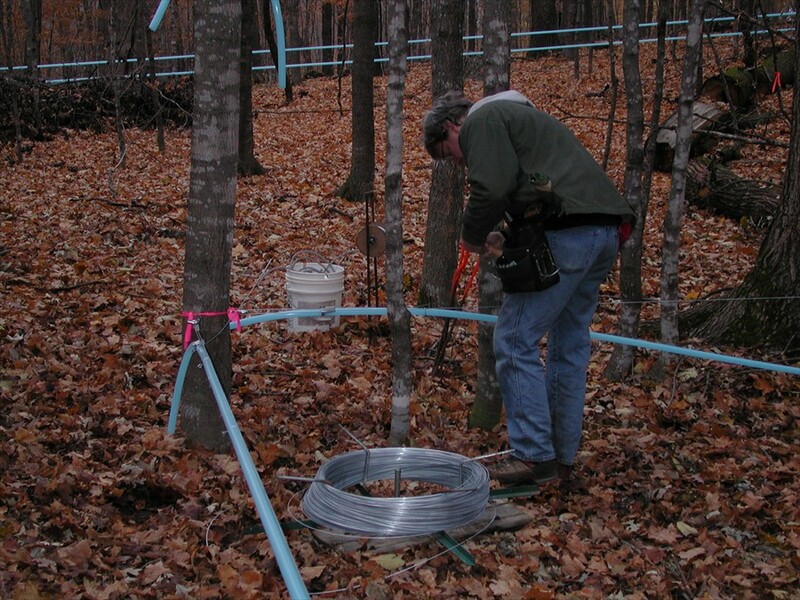 This is done by drilling a small hole in the tree and tapping a metal or plastic spout into that hole. A bucket is then hung on the spout and a cover is put on to keep the rain out. 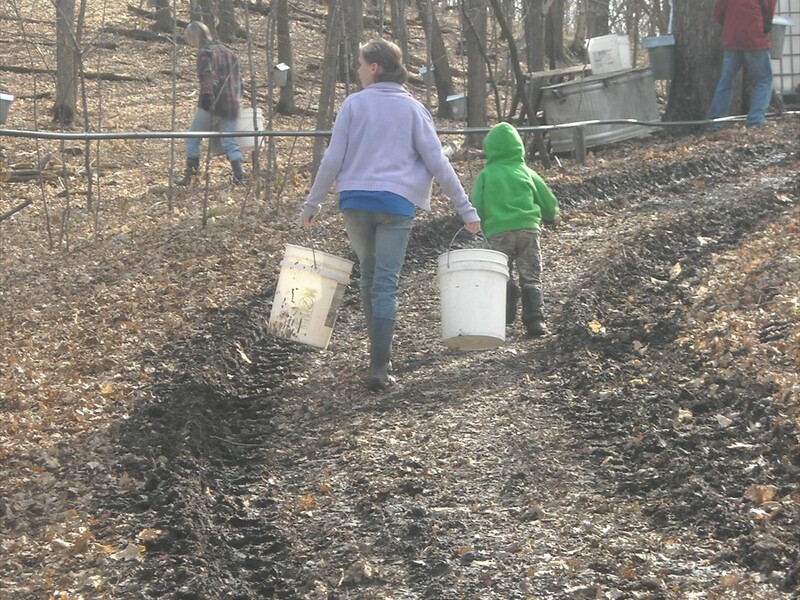 The sap then runs down the spout and drips into the bucket. 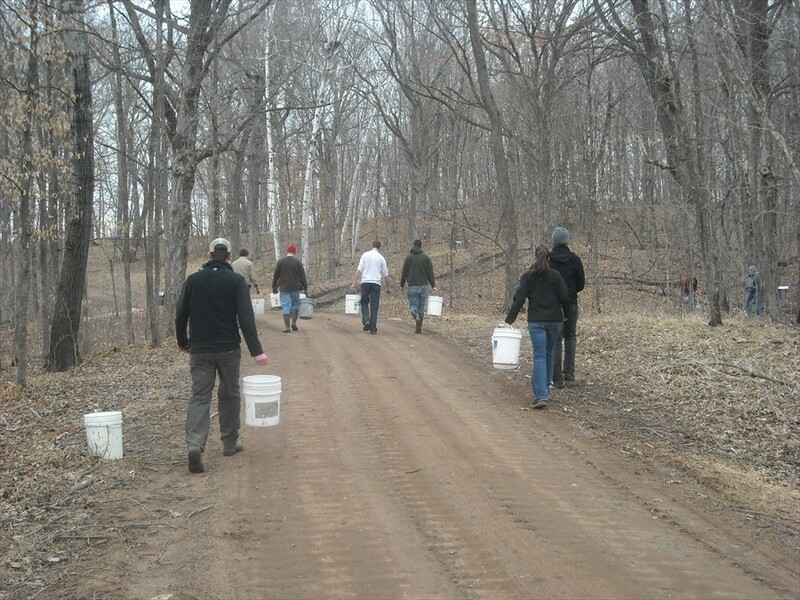 The buckets on the trees hold about 3 gal of sap but each tree is different in how it “runs” so not all the buckets will be full at the same time but when they are ½ to ¾ full we all head to the woods to collect the sap. 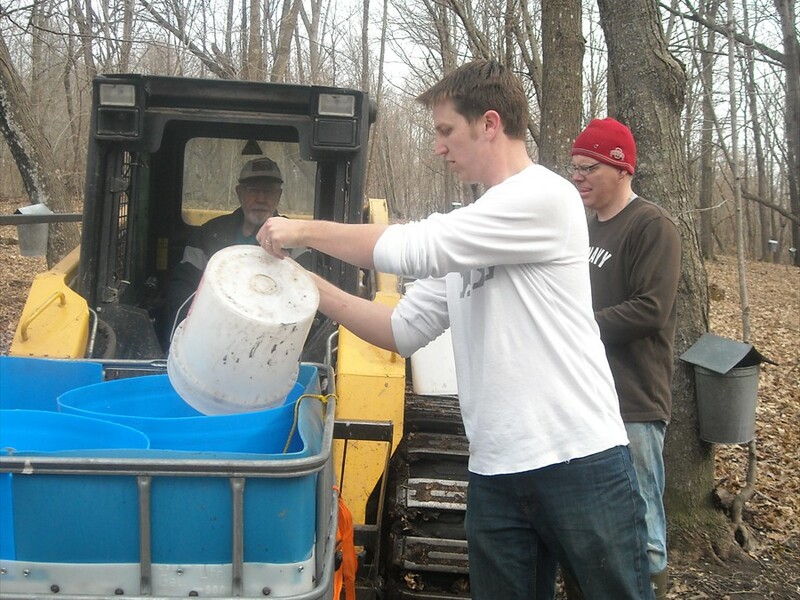 The sap is dumped into 5-gallon buckets, then carried to a big collection tank on the skid steer. 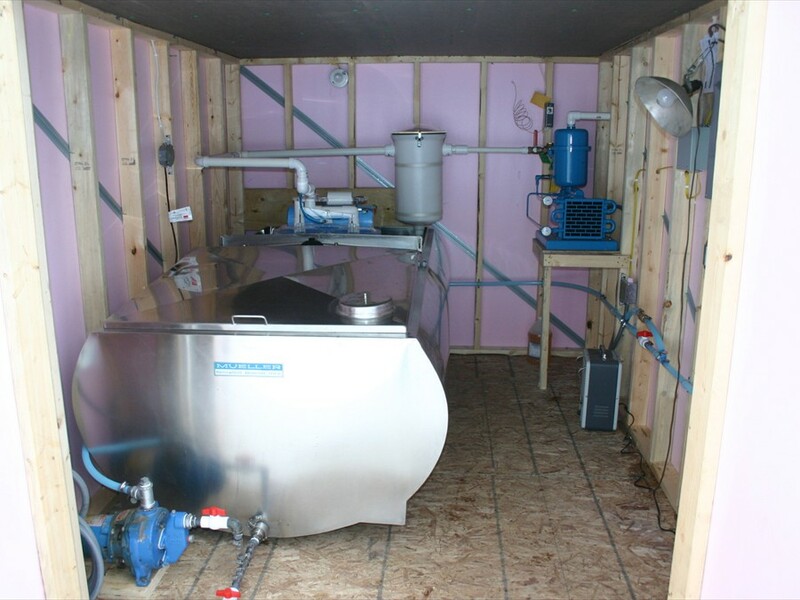 From there it goes into storage tanks by the Syrup Shack until we have enough sap to fire up the cooker. 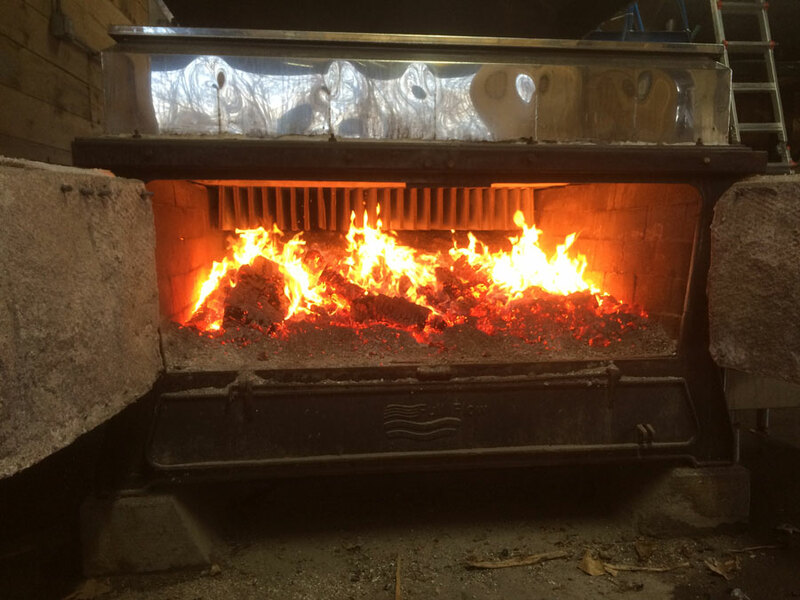 Because our cooker will cook off about 350 gph or more, we like to have at least 2000 or more gallons of sap on hand before we fire the cooker. Once the sap turns to pure syrup it is drained off the cooker and run through a filter press and stored in 55-gallon drums until we take it to the bottling plant where it is reheated, tested and filtered again just before it is put into bottles. 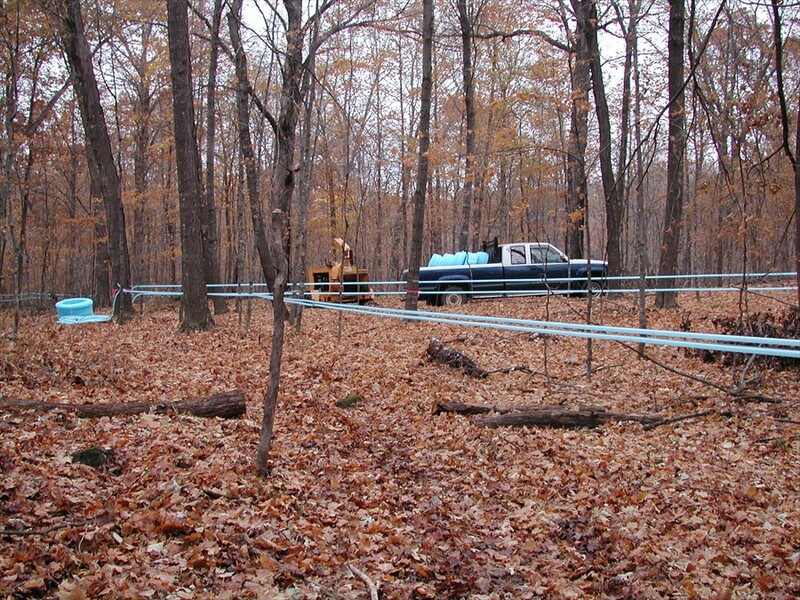 The Wilderness Fellowship not only has the ability to use 700 to 800 buckets, but also has about 950 taps on a vacuum pipeline system. 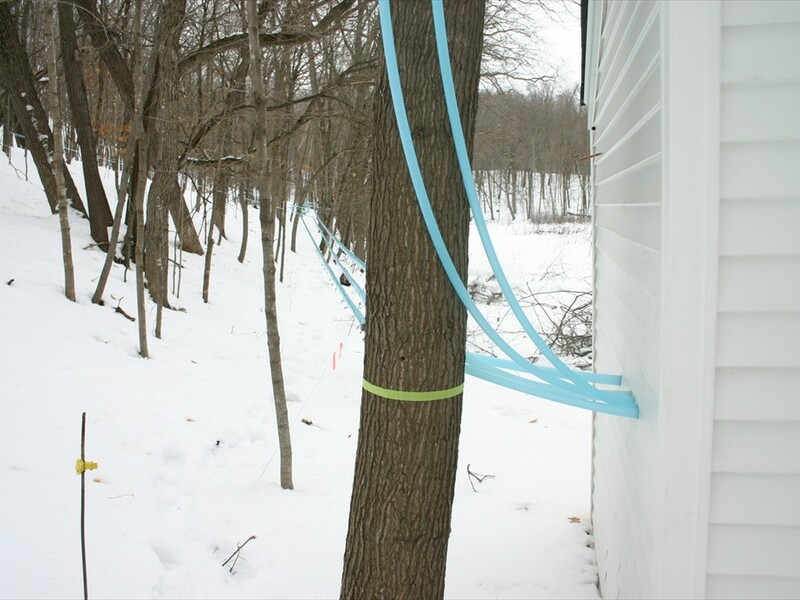 These are plastic vacuum lines that run to every tap and we literally draw the sap out of the trees with a vacuum pump. 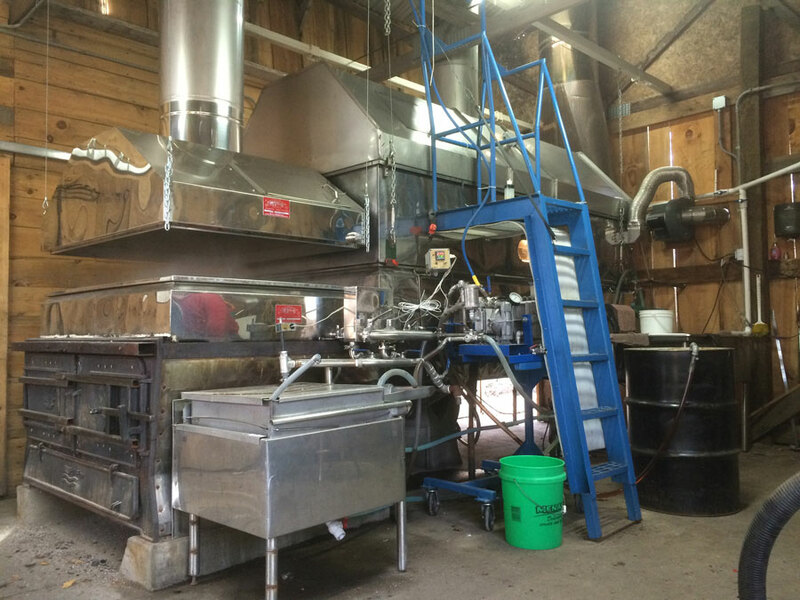 Vacuum produces much more sap than the traditional “dripping” out process, but the sugar content is lower on the vacuum lines so it takes more sap to make a finished gallon of syrup. 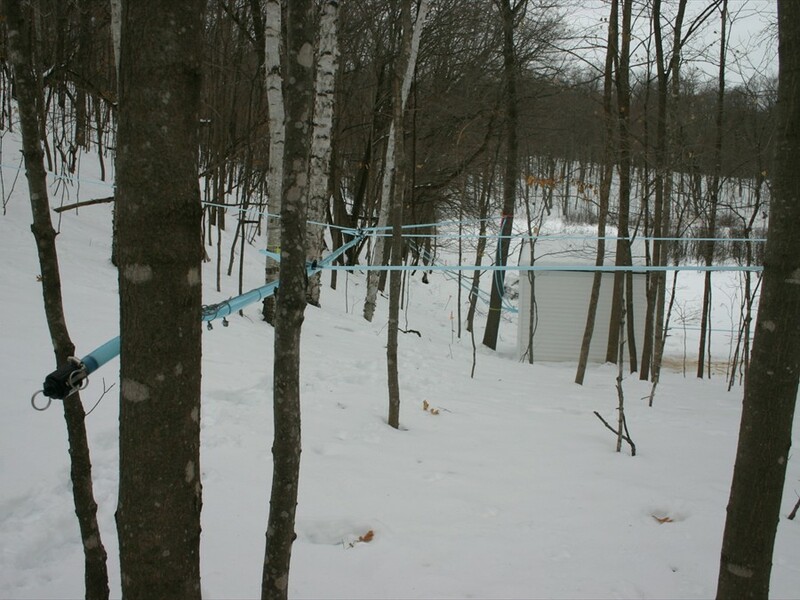 With this system, the sap is all gathered to one spot where it goes through a “releaser” which dumps the sap out of the lines. 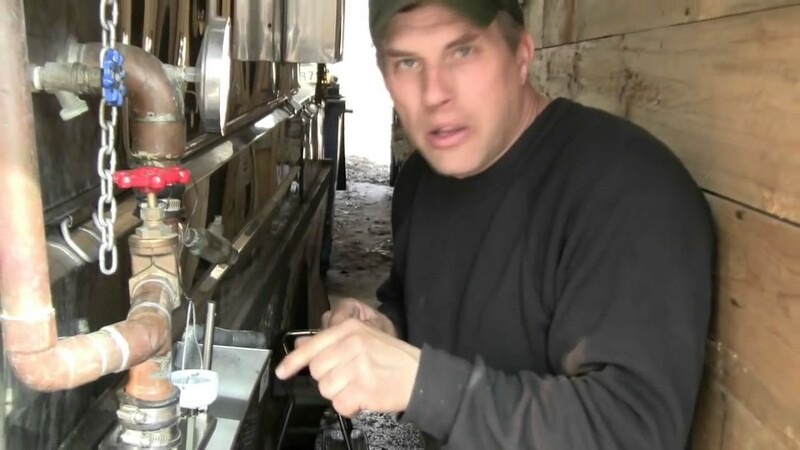 Then the sap is pumped to holding tanks right at the Syrup Shack. This saves going out to the woods to collect the sap by hand, and also increases the amount of sap we can cook. Hit the Play button, below, then click the Full Screen icon in lower right corner. How much does your maple syrup cost? Quarts are $18/bottle, or a case of 12 quarts for $180. Pints are $10/bottle, or a case of 12 pints for $100. Decorative Leaf Bottles are $5/bottle, or a case of 12 for $60. Do you ship maple syrup? No, we do not ship maple syrup. It is too costly and the product is fragile (glass bottles). You are welcome to purchase the syrup at TWFM, or check the list of places that sell our maple syrup in Wisconsin, Minnesota or Online: See the Where To Purchase Our Syrup section of our Maple Syrup web page. 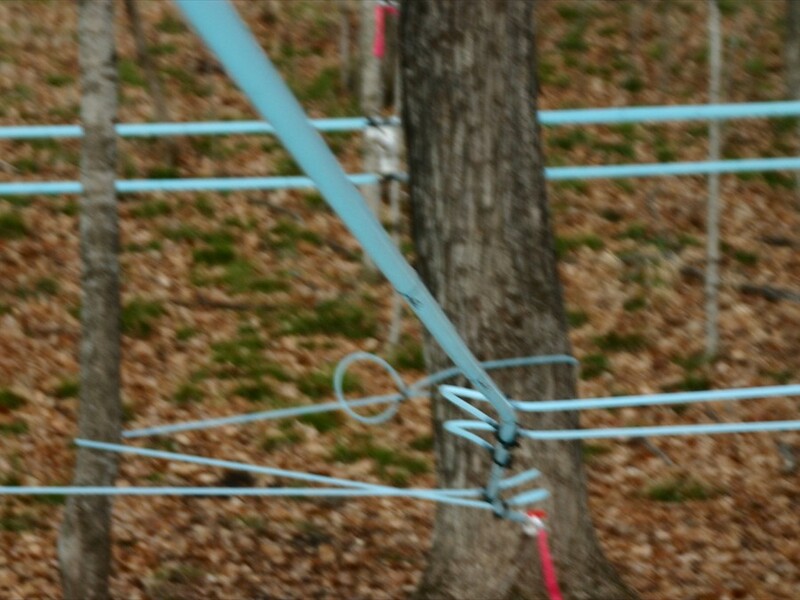 When do you make maple syrup and can we come watch? 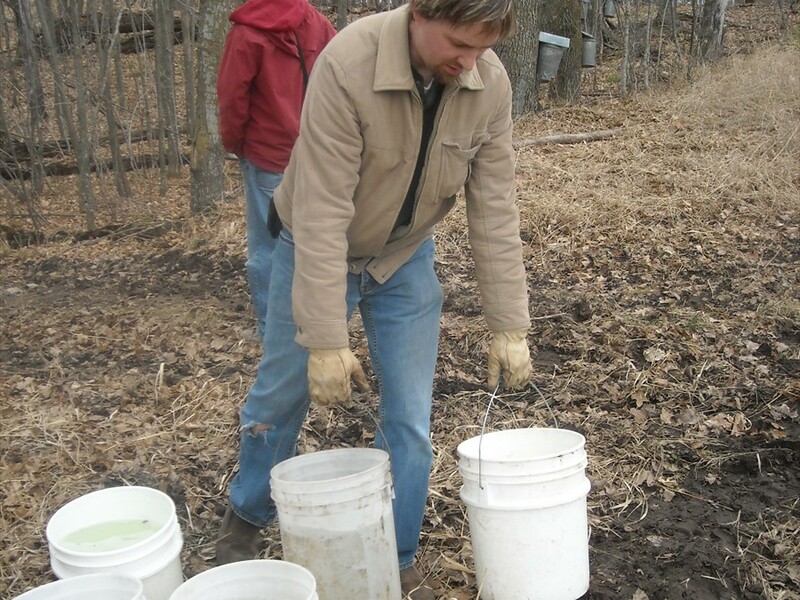 Maple sap is usually harvested and cooked between March 15 and April 15 each spring. You are welcome to help with the process, or come watch the process. Call ahead of time to find out when we might need help or what days we might be cooking. Our syrup comes in different sized bottles and can be purchased by the bottle or the case. We usually have quarts, pints and one specialty “Maple Leaf” type bottle available. 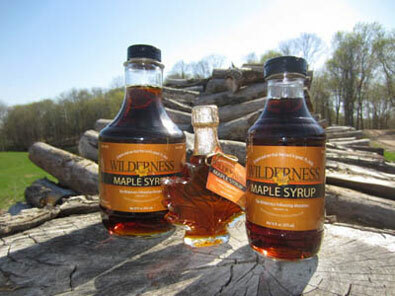 If you are interested in purchasing some of our maple syrup, contact us and we would be happy to try to help make arrangements for pick-up either here at our office or perhaps put you in contact with someone closer to you who may have some of our product on hand. We are hoping to find additional outlets for the syrup so as this list grows we can let you know through this site about new locations where our maple syrup is available. If you know of any place that might be interested in carrying our product please let us know.